Android 4.4.2, KitKat, is the latest release of the Android platform. KitKat includes enhancements such as restyled status and navigation bars, a new full-screen mode, color emoji support, improved closed captioning support, stronger security, smarter power use, and more tools and capabilities for better app development. Improved the phone app with the ability to look up contacts directly from the dial pad, see and tap frequent contacts, and search your corporate directory easily. Enhanced the "touch to focus" option with a new circular, on screen control that can be dragged by your finger around the viewfinder to adjust a photo's focus and exposure. Added new photo editing options to the Gallery app including new filter effects, draw on your photos, advanced cropping, and adjustments to color, exposure, contrast and more. Added support for printing photos, Google Docs, GMail messages, and other content via Wi-Fi, Bluetooth and hosted services like Google Cloud Print and HP ePrinters. Incorporated a new version of Google Hangouts that supports integrated SMS/MMS messaging. Hangouts can be set as the default SMS app under Settings > Wireless > Default SMS app. Added support for Square credit card reader. For more, check out the official release notes right here. The new build number is 172.44.4, and rollout begins immediately. 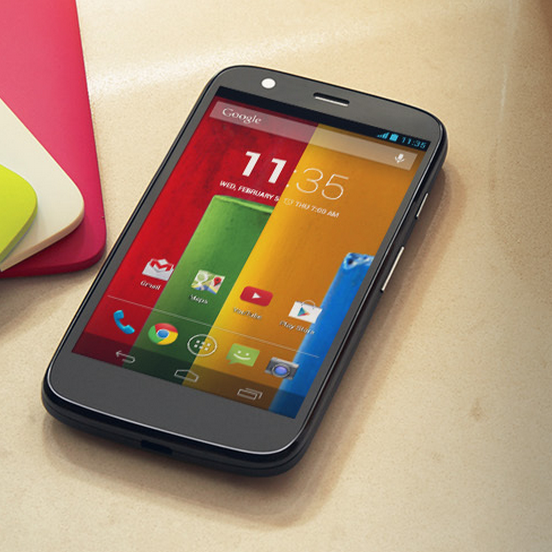 This news comes on the heels of the Android 4.4 release for the DROID lineup on Verizon, which by Verizon standards arrived lightning-quick, though today's Moto G announcement goes to show just how fast the new Motorola is iterating software for its devices - Google fast.